The ancient Greek and medieval philosophers described space, time, rest and motion in abstract, arbitrary and absolute terms, rather than in terms relative to an object or an observer. In 1687, Isaac Newton reaffirmed some of these arbitrary and absolute concepts as a part of his “theory of measurement,” and they have continued to influence and distort scientific thought until the present date. Throughout history, humans have quite naturally sought to explain mysterious physical phenomena that were not then understood. The natural occurrences of fire, lightning, thunder, earthquakes, volcanoes, hurricanes, floods, and lunar and solar eclipses must have been especially frightening to early mankind. The first attempted explanations of such puzzling events were primarily supernatural: they were caused by angry spirits, demons, witches, devils or gods. Such mystical explanations were often accompanied by contrived myths that further attempted to rationalize a baffling occurrence. The Sun and the stars were particularly bewildering phenomena for many early civilizations. The Egyptians and the Mayans worshipped the Sun because it seemed to provide so many amazing benefits. The Egyptians even invented a Sun god (Ra-Horus) and an early form of astrology to explain and justify the motions of the Sun and stars across the sky, the seasons, and the 26,000-year precession of the Earth on its axis. Later, the Greeks created both a god (Apollo) and a myth (his flaming chariot) to explain the existence of the Sun and its daily motion across the heavens. The Babylonians, Persians, Greeks and the Romans also created many other gods and myths, each to explain a different unfathomable phenomenon. As knowledge of natural phenomena increased, many scholars moved from the supernatural into the realm of metaphysics (arbitrary and abstract principles). Ancient Greek philosophers believed that the human mind could, by reason alone, discover the great principles and absolute truths that governed all of nature. Aristotle (384 – 322 BCE), the most prolific and influential philosopher of antiquity, rationalized that there were only five basic elements: air, earth, fire, water, and quintessencence (Collins, p. 31). He stated that the natural place for all objects was being at absolute rest on the face of the Earth. Aristotle conjectured that once each day the planets (“wanderers”) and “fixed stars” revolve around the stationary Earth, which was located at the absolute center of the universe. Since the circle was considered to be the most perfect geometrical figure, Aristotle also arbitrarily reasoned that the planets must wander around the Earth in absolutely perfect circles (Bohm, p. 5; Figure 2.1A). 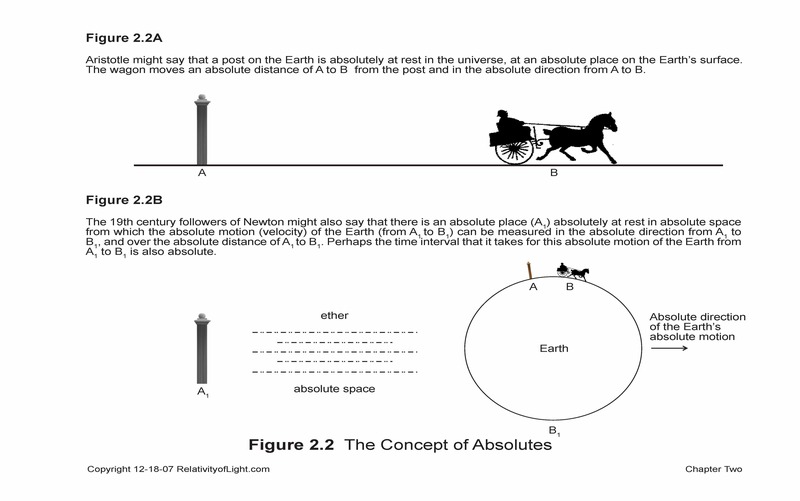 What might Aristotle have said about absolute motion on the Earth (see Figure 2.2A)? Ancient Socratic philosophers talked in abstract terms of absolute space, absolute rest, and absolute time. These arbitrary spatial and temporal doctrines resulted in certain places and concepts that enjoyed a favored role in nature (Bohm, p. 5). Such arbitrary concepts were believed to be absolute laws of nature that had been discovered solely through thought and reason.There never was much consideration about observations or experiments to determine whether or not there was empirical support for such rationalizations (Bird, pp. 20-23). The absolute doctrines of Aristotle and his brethren continued largely unchallenged in western culture throughout the middle ages. In fact, they were even enhanced and made more rigid by the medieval Scholastics. The Scholastics turned Aristotle’s arbitrary and abstract concepts into rigid axioms or laws of nature that dominated European thinking during the dark ages (Bohm, p. 4), and some of Aristotle’s laws have even influenced physics well into the 20thcentury (Bohm, p. 4). The axioms of the Scholastics further contributed to the notion that certain places, times and things played a special or favored role in nature (Ibid, p. 5). As late as the 15th century A.D., most civilizations still believed that a flat Earth existed at the center of the universe, and that if one ventured too far in any direction he might fall off the edge. Alchemists continued to believe in the myth that lead could be turned into gold, and physicians of that era practiced the ritual of bloodletting to cure unfathomable physical ailments. Alchemists and early scientists also concocted bizarre theories and fictitious substances in attempts to explain the bewildering unknown. An imaginary fatty earth substance called “phlogiston” was contrived in order to explain the ingredients that were lost in the flames when something was burned. A fanciful fluid called “caloric” was dreamed up to explain the puzzling phenomenon of heat. Even during the early seventeenth century, Descartes conjectured the existence of a mythical substance called “ether” in order to attempt to explain how light could travel through space. Once accepted into the mainstream of scientific philosophy, spurious concepts like these died slowly. Worst of all, these and other examples of metaphysics created a mindset that tended to restrict reason, to stifle scrutiny and to retard the progress of legitimate science. During the dark ages, explanation of natural phenomena by means of the human senses remained a dangerous distraction from eternal salvation and was thought to be “a corrupting influence on Christian virtue” (Gleiser, pp. 54-56). Typically, during the 6th century A.D., St. Augustine wrote that such “knowledge is of no value… nor do I care to know the course of the stars ” (Ibid). Instead, medieval philosophers pondered esoteric questions, such as how many angels could dance on the head of a pin. By the 13th century A.D., theologians were hard at work reinterpreting Aristotle to further the dogma of the Catholic Church. The Holy Fathers had little use for enlightened thinkers such as Roger Bacon (1219 – 1292), who wrote: “Cease to be ruled by dogmas; look at the world” (Gleiser, pp. 66-67). In 1539, protestant leader Martin Luther sharply criticized Copernicus: “that fool [would] reverse the entire art of astronomy” (Hartmann, p. 63). Absolute belief continued to rule over empirical observation. Paradoxically, it was Polish Catholic priest Nicholas Copernicus (1473 – 1543) who initiated the break with the “absolute” past. In 1512, just 20 years after Columbus discovered America, Copernicus privately distributed a short version of his radical theory that the wandering planets (including the Earth) orbited the central Sun (Hartmann, p. 63). Copernicus also demonstrated that Ptolemy’s contrived system of epicycles was not necessary if it could be assumed that the planets moved around the Sun (Figure 2.1B). The concepts of Copernicus shattered Aristotle’s doctrines of favored places in absolute space and special moments in absolute time. Most importantly, the Copernican theory suggested that mankind and the Earth might not occupy the special central position in the cosmos. Rather, Copernicus asserted that the Earth and the other planets moved in orbits relative to the central Sun. These radical relative concepts ushered in a period of skepticism, scrutiny, experimentation, and consideration of the relationships between natural phenomena (Bohm, p. 6). By the end of the 16th century, Italian philosopher Giordano Bruno was theorizing in London that the universe was spatially infinite. According to Bruno, there was no outer edge or center in the universe (Munitz, pp. 174 – 181). If this were true, then the laws of nature would retain their relationships no matter what object or direction to which they were related. These new concepts of Copernicus and Bruno described relationships, not absolutes. Bruno was burned at the stake in 1600 for his radical beliefs. A few decades after Copernicus died, skeptical and curious European scholars like Galileo Galilei, Tyco Brahe, Johannes Kepler, and René Descartes began to use observation, experiments and empirical data, in addition to reason, to determine and measure the real causes of natural phenomena. 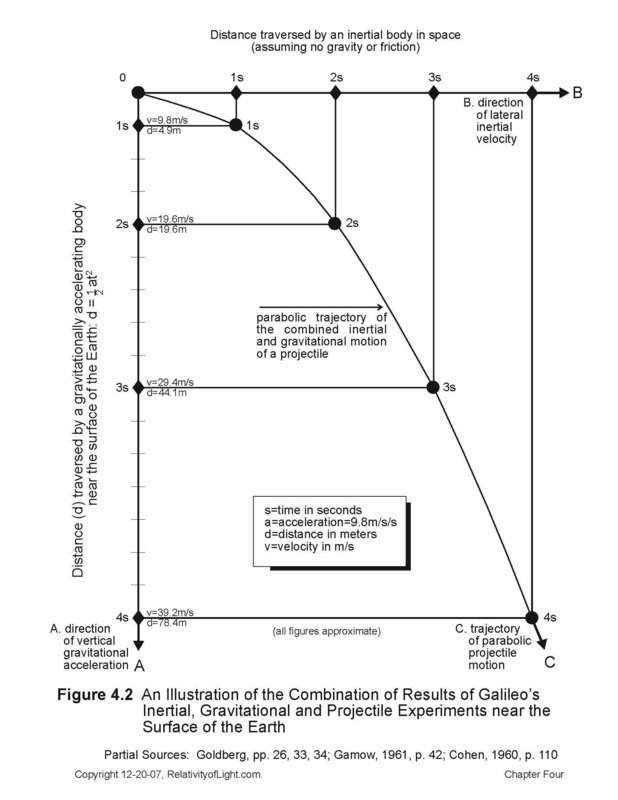 For example, after years of experiments and observations, Galileo discovered and measured the relationship between the time intervals and the accelerated motions of objects falling relatively to the Earth (see Figures 4.2A and 4.2C). After years of studying Tyco Brahe’s voluminous data based on Brahe’s planetary observations, Kepler finally discovered and measured the relationships of the planets’ orbits relative to the time interval, distance, and orbital path traveled by each planet (Cohen, 1985, pp. 136 – 140). For the first time in western philosophy, the role of the observer (or measurer) and his senses became as important as the role of the thinker. Slowly during this early scientific period it was realized that the real causes of natural phenomena resulted from relationships that were purely spatial, temporal, mechanical, chemical, optical, etc. in origin. Gradually it became apparent that the answers for most scientific questions could not be decided by arbitrary and absolute laws, but rather required specific hypotheses, observations, experiments, measurements, and conclusions relative to an object or an observer. This process ultimately became known as the “scientific method.” Nevertheless, the absolute concepts of space, time, rest, and motion resisted change. “to understand how the fundamental primitives…mass, length [space] and time, are measured and how one relates measurements made in different [moving bodies]” (Ibid). In 1687, Isaac Newton (1642 – 1727) in his great three-volume work known as Principia, briefly described, analyzed and somewhat modified the age-old concepts of space, time, and motion which became his “theory of measurement. ”These age-old concepts and Newton’s theory of measurement are contained in a few paragraphs near the beginning of Principia. It is important to emphasize that most of Newton’s 17th century theory about space, time, rest, and motion had been accepted by philosophers for centuries, so “Newton hardly discussed it and almost never referred to it” (Goldberg, p. 103). “One of the reasons that few scholars pay attention to the fact that Newton [even] had a theory of measurement is that the theory was never made explicit” (Ibid, p. 68). Newton asserted in his Scholium of Definitions, that “absolute space… without relation to anything external, remains always similar and immovable… absolute motion is the translation [motion] of a body from one absolute place to another… absolute rest is the continuance of the body in the same part of that immovable space” (Newton, Principia, [Motte, pp. 6, 7]). These were all absolute concepts. Newton’s concepts of absolute space, absolute place, absolute rest, and absolute motion will be very relevant to this treatise for many reasons, as we shall discover in later chapters. These artificial concepts distorted many physical theories over the intervening centuries. Not the least of which was the 19th century myth of a material substance called “ether,” which theoretically filled all of Newton’s absolute space. Ether was believed to be at rest in space. In effect, it was an absolute place from which absolute motions of material bodies could be measured in any absolute direction. This mythical concept of “stationary ether” in turn distorted all of physics for over a century, and its repercussions remain with us to this day. “Because the parts of [absolute] space cannot be seen, or distinguished from one another by our senses:, therefore, in their stead we use sensible measures of them ” (Ibid, p. 8). “Relative space is some moveable dimension or measure of the absolute spaces, which our senses determine by its position to bodies…” (Ibid, p. 7). However, because the definition of any “relative space” could only be achieved by reference to “absolute space” (Jammer, 1954, p. 98), Newton’s concept of “relative spaces” as a sensible measure of “absolute space” was also an absolute concept. What Newton and his predecessors were attempting to do with their concept of “immovable absolute space” was to hypothetically and metaphorically drive a stake into the void of celestial space which could be considered as immovable and absolutely at rest, and from which their concepts of an absolute place and absolute motion of bodies could be measured (Figure 2.2B, and Gondhalekar, p. 95). However, this concept of empty space (nothing) as an absolute place of reference at rest from which the position and motion of material bodies can be measured, on its face, is a meaningless concept. First of all, the concept of rest can only apply to material objects. How can “nothing” either move or be immoveable and at rest? How can empty space, which is theoretically “nothing,” have the properties of “something?” A priori it cannot. Secondly, since “rest” is a relative concept, what is the nothingness of infinite empty space at rest relative to? More nothing? Thirdly, a place of reference for the measurement of position or motion of material objects must by definition be a tangible, ascertainable position or body (Einstein, Relativity, pp. 6 – 9). Empty space, on the other hand, being “nothing” is completely abstract and intangible. There is no ascertainable position in the nothingness of infinite empty space that could qualify as a tangible place or body of reference. Thus, it follows that there is no such thing as an absolute position at rest or an absolute motion measured from it, and one cannot even determine or measure the relative position or motion of a material body with respect to nothing (Dingle, 1940, p. 1). In effect, Newton confused the concepts and properties of the void of celestial space with the concepts and properties of material bodies, such as Earth and material objects on it. A stake in the ground is a place on Earth that is relatively at rest with respect to other places and stationary objects on Earth. From this stake can be measured the definite distance to the observed position of another relatively stationary object on Earth, and in a relative direction. If the object changes its position over time (motion), this change of relative distance and its trajectory can be measured in a relative direction. If two objects simultaneously change their relative positions over time, this relative motion can be measured in different relative directions. The above discussion answers the question: how can the relative motion of a tangible body through empty space be mathematically described and measured? However, it begs the answer for two other fundamental questions: 1) Does empty space exist, does it have any properties, does it have any meaning, and can it be considered to be a medium? 2) Can something that moves relative to the medium of empty space (i.e. a transmitting ray of light) have any meaning if its velocity cannot be mathematically described or measured relative to such medium? Of course, the nothing of empty space exists and has meaning in the sense that celestial bodies are constantly observed to exist in it and empty space separates such bodies. It also has meaning as a “medium” in the sense that physical things (including light) move or propagate through it. These are the intangible properties that empty space has, as well as the fact that space appears to be infinite in all directions. The fact that humans have difficulties conceiving of these properties, or that it is difficult for mathematicians to conceive of, describe or measure something (including a constantly transmitting ray of light) having a velocity relative to the medium of infinite empty space, is their problem to deal with. Today, these empirical facts can be precisely measured and verified by sophisticated current technology without the need for any mathematical descriptions or measurements. “…for it may be that there is no body really at rest, to which the places and motions of others may be referred…” (Newton, Principia [Motte, pp. 7-8]). Still, it is obvious from the above discussion that Newton’s classical concepts of space, position, rest, and motion were never fully thought out nor articulated in depth. “Absolute, true and mathematical time, of itself, and from its own nature, flows equally without relation to anything external, and by another name is called duration”  (Newton, Principia [Motte, p. 6]). It is obvious from the above statement that Newton assumed that there was an absolute universal time in the Cosmos that was true or meaningful for all observers. One implication from Newton’s above assumption is that all events in the Cosmos at any instant in time occur simultaneously. Another implication from such assumption is that the instant of observation or perception of a distant event has an absolute meaning for all observers. Thus, every observer will assume that everything he sees at a great distance is happening “now,” at the instant that he perceives it with his eyes. This misassumption would mean that there is no time interval delay between the happening of the distant event, such as a supernova, and the instant of our perception of it. The basis for this false assumption was the ubiquitous belief during the 17th century that the light signal propagates at an infinite velocity. Newton and almost everyone else of his time believed that light had an absolute velocity: that light transmits from one place to another…instantaneously. In 1679, Newton met in London with Danish astronomer Olaas Römer, who three years before had developed a theory that the velocity of light was finite, not instantaneous (EB, 1969, Vol. 19, p. 439d). By 1679, Newton was well aware of Römer’s empirical hypothesis, vis. that the velocity of light was finite, not infinite. However, he failed to incorporate Römer’s theory into his “Principia,” because it was still just a speculative hypothesis in 1687. Newton’s misassumption of a meaningful universal time for all observers distorted measurements of time intervals and measurements of motions during the 18th and 19th centuries. These distortions were realized by most scientists after Bradley (in 1728) proved that Römer was correct: light does have a finite velocity. Nevertheless, many prominent mathematicians (in the interest of mathematical simplicity) intentionally refused to factor the time interval delay of the light signal into their equations (Miller, p. 176; Neffe, p. 129). It was this refusal that finally prompted Einstein to invent his Special Theory of Relativity in 1905 (Chapters 20D and 25). “…relative, apparent, and common time is some sensible and external …measure of duration by the means of motion …such as an hour, a day, a month, a year”  (Ibid). “…absolute time [eternity] is not liable to any change.The duration or perseverance of the existence of things remains the same, whether the [relative] motions are swift or slow, or none at all…” (Ibid, p. 8). Thus, Newton distinguished the inevitable passage and eternal continuation of time, or the “perseverance of the existence” of all things in the universe, from the external (not inherent) or relative measure of duration (time intervals) that the observer perceives by periodic motions or clocks. There is no doubt that Newton reaffirmed some of the ancient arbitrary and absolute concepts about space, time, rest, and motion, and that these concepts continued to influence scientific thought well into the 20th century. Still, it is important to realize that Newton’s laws and concepts, which governed all of mechanics during the 18th and 19th centuries, did contain a mixture of absolute and relative approaches to physics (Bohm, p. xii). For example, Newton’s three laws of motion and his law of universal gravitation all involve critical relationships between material objects and observers, as does his restatement of the mechanics phenomenon of Galileo’s Relativity (see Chapters 4 and 5). By the 17th century, the absolute concepts of antiquity were changing. At this point, perhaps we should pause and ask the questions: why are we, in the twenty-first century, even discussing these ancient, absolute, amorphous and imprecise concepts of space and time measurement? What relevancy do they have to this treatise? The answers are as follows. During Newton’s time these concepts were the state of the art for measurements of space, time, motions and the velocity of light. They were implicitly included in Newton’s theories of motion, mechanics and gravitation. The absolute theory of “ether measurement” and many other false theories of physics were based on Newton’s concepts during the 18th, 19th and early 20th centuries. In order to understand, appreciate, and distinguish the correct theories, we must first understand the incorrect theories, their evolution, and why they were incorrect. Throughout this treatise we continue this process of skepticism and scrutiny with respect to all theories, including Einstein’s. What is the underlying message of this chapter? Is it that assumptions and theories that appear to be reasonable and have passed the test of time may, in fact, be invalid? Is it that an authoritative stamp of approval does not mean that a hypothesis is correct? Is it that invalid, absolute concepts may masquerade as valid, relative ones? Is it that established theories might be demonstrated to be wrong when scrutinized in a different way, or by different people? Or is it that scientific icons, like Newton and Einstein, sometimes author absurd ideas? Actually, the underlying message includes all of the above.